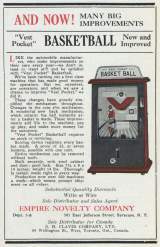 Vest Pocket Basket Ball © 1929 Fairchild Amusement Machine Corp.
- Greatly reduced prices for operators and quantity buyers, effective at once. 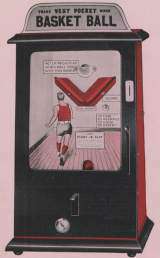 - Five-cent coin mechanism, if desired, attached to each machine in place of the one-cent mechanism, extra, on each machine. - Beautiful new Crack-a-lac finish. Size: 7.25 x 9 x 14 inches.